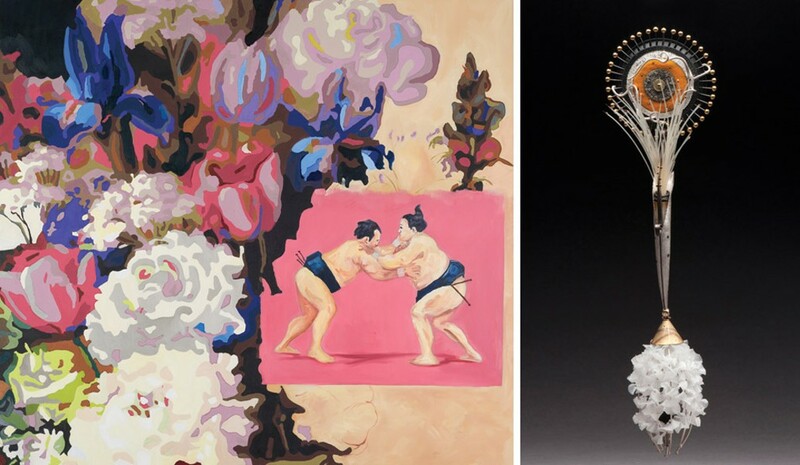 PHOTOS PROVIDED "Incidents II — Sumo" by Lynette K. Stephenson (left) and "Mother's Brooch" by Juan Carlos Caballero-Perez (right) are part of the 6th Rochester Biennial, currently on view at the Memorial Art Gallery. Through Sunday, September 21Memorial Art Gallery, 500 University AvenueWednesday-Saturday: 11 p.m. to 5 p.m.; Thursday 11 a.m. to 9 p.m. | $5-$12 | 276-8900; mag.rochester.edu. The 6th Rochester Biennial opened last Saturday, featuring six small solo shows of work by established, regional artists chosen for their exceptional commitment to their craft. The exhibition contains a vast range of media, techniques, and subject matter, affording the audience a glimpse into the diverse array of skilled artists working in our communities. Each collection is fascinating and engaging in its own way, and at times challenges the viewers to consider what is shared and what is unique in our experiences of this odd human existence, as well as the obvious things we dangerously miss entirely. Ithaca-based printmaker Kumi Korf's statement says color is the most important in her elegant and enigmatic work. In these recent intaglio and aquatint prints and etchings, Korf used stencils to create overlapping colors and shapes, with richly hued organic forms blinking into and out of existence on the papers. In "Delirium," serpentine lines chase one another over areas of shadow and light, and poetic verse is printed right side up and upside down. The prints are rife with organic forms blushing with watery pigment. Meant to represent clouds, birds, flowers, shadows, and bodies of water, each existing within shifty, half-formed dreams. Rochester Institute of Technology professor and Churchville-based artist Richard Hirsch's work is characterized by the term "heat." Hirsch's newly fabricated sculptural objects and paintings possess the illusion of weathered, worn surfaces. Through a nuanced attention to texture and expert glazing techniques, soda- or wood-fired clay becomes bronze, wood, or stone. Tertiary tones burst brightly against earthen hues like blooms of rust or mold, a flush of flux in timeless materials. Hirsch's nonrepresentational encaustic and clay paintings with minerals and dry pigment resemble heavily textured cement walls or an aerial view of razed land far below. His oversize crucibles and "Mortar and Pestle" are like monuments to tools of another time, and it's easy to picture a set of giant, aged, warm hands cradling the forms, steadily pulverizing plants. Henrietta-based artist and RIT professor Juan Carlos Caballero-Perez's breathtaking and intricate ornamentations are created in homage to his mother, who worked as a seamstress in Mexico City and patiently taught her son to sew. Throughout this collection of sculptural jewelry and vessels, the artist elevates humble materials through careful incorporation with more prized stones and metals. Nods to his mother's trade abound, in the way that plastic is ruffled ornamentally, and elements and forms allude to stitches, bobbins, needles, and repeating patterns. "Stitching II," is a beautifully balanced cuff, referencing a wrist-worn pin cushion. The otherworldly adornments seem fit for royalty, the urns gorgeous resting places for the most precious of ashes. Hamilton-based artist Lynette K. Stephenson says the large-format oil paintings in her "Incidences and Observations" series explores the "profound strangeness of life." Most of the works focus on figures and the ground drops away; even in "Flood," the roof of a house and treetops are the only tangible, bright spots in a wash of murky horror. Several of the paintings contain overlaid, seemingly disparate imagery, suggesting multiple inner and outer perspectives, as if the subject of the painting looks out at a world superimposed with a conjured reverie or two. Just as in life, the viewers are stuck apprehending a series of baffling partial-narratives and situations, and must bring their own interpretations and navigational tools to the table. Rush-based artist Jeff Kell's sturdy, archetypal ceramic work explores the various relationships and bitter-sweet memories associated with home and family, and humorous anecdotes from daily life. The dichotomy of the family dog is explored in two works, which contrast the animal's sweetness toward the owners with its explosive ferociousness toward a stranger at the door. "Dog with Bone" features an alert pup balancing a trophy on his head, the vessel illustrated with imagery of a gentlemanly pooch, while "Beware of Dog" is part pet, part rocket, his eyes crazed and face frozen in a snarl. Manlius-based artist Kim Waale has but one work in the show, an exploration of artifice in a room-sized installation titled "Simulacrutopia (again)," which alludes to a simulated representation of a near-perfect reality. The work is gently contemptuous toward our so-called love of nature, referencing our replacement of natural settings with surreal, sterile representations of itself for our recreational desires. At one end of the room, an outcropping of foam "rocks" juts from high up on the wall, with cast-rubber "rivers" falling in tendrils which trail off in a freeze-flow across a low collage of maps. Spun and spray-painted plastic wrap over wire effectively simulates rushes and reeds sprouting from the reordered islands and continents, and remnants of animal life, such as spiderwebs or antlers, are mere decorative relics. A mechanical songbird, set off by a motion detector, acts as a threshold guardian, releasing a jarring cry as viewers enter the environment. We are makers of strange, new and rapidly arising realities, rabid shapers of the world. Waale's work predicts a plastic and sanitized world, essentially nothing more than a stage on which we can finally act out our most desired roles: as revelers in a safe, alterable, anaesthetized playground. Already, scientists have discovered bacteria which consume plastics. There is little doubt that nature will carry on, working with what we put into it, but we food-chain-toppers cannot recreate what is essential to our own survival much long after we have poisoned the well.